7.83 acres. A Lovely Location for your Recreational Property in Canada. Lot 6, PID 05114251, Green Road, Mount Pleasant, New Brunswick. 7.83 acres or 3.17 hectares. Located 4 miles north of the friendly countryside community of Elgin, this large, rectangular parcel of land is located in a quiet, lightly developed region where brooks and rivers pass through vast forests. An excellent recreational property with adventure in all directions. Land located along Green Road in Pleasant Mountain, in the Parish of Elgin, in the County of Albert, and Province of New Brunswick, Canada. Lot 18-6 on a registered Plan of Subdivision. Lot Size: 7.8 acres or 3.17 hectares. - Year around access is via Green Road – a well maintained gravel road plowed for snow in winter months. - Electricity and phone service available. - 73.96 meters (242.65 feet) of road frontage. - Excellent topography with elevated sites and southwesterly views of the countryside. - Low annual property taxes and no requirements to build or improve. - 5 minutes to the community of Elgin. - Near the Pollett River. - Excellent outdoor adventure and hunting in the region. - A convenient distance to the major city centres in the Province of New Brunswick and airports. Here is an affordable recreation lot with great potential to use in all seasons - Summer, Winter and Fall – with power and phone at roadside. 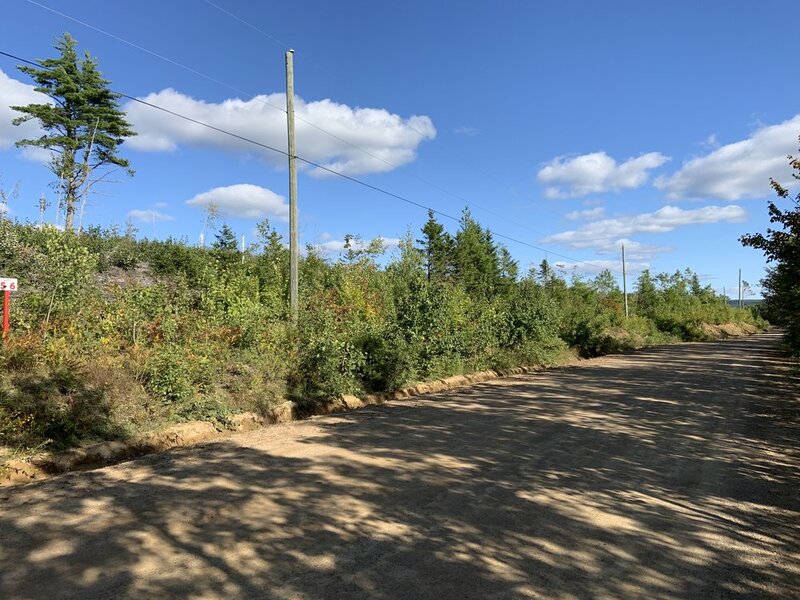 This surveyed 7.83 acre parcel is located along Green Road – a quiet stretch of road in the lightly settled Pleasant Mountain area just a 5 minute drive from the small community of Elgin and within easy reach of larger towns and cities in the province. This is a increasingly popular spot for recreation cabins and winter camps where you have access to marked and maintained recreation trails for ATVing, snowmobiling, snowshoeing, hiking, cross-country - the incredible network of trails can take you to the Bay of Fundy, Caledonia Mountain, Hillsborough and the Peticodiac River and even up to Moncton. White tail deer and small game hunting is excellent in the area. The land is gently sloping up from Green Road and the ground is high and dry. Topography allows easy construction of driveway into the land and elevated sites with southwesterly views overlooking the surrounding woodland towards Gowland Mountain and Boyd Mountain in Elgin. Electricity and phone services run along roadside and can service any future building within your land. There are no restrictive covenants and no requirements or time-line to build or develop the land, allowing you to hold the land 'as is' for as long as you like and improve the land at any time in the future. A land survey has been completed and the lot is well marked. At roadside the lot measures 242.65 feet (73.96 meters), averaging 1,411.06 feet deep (430.09 meters), and the back line measuring 285.90 feet (87.14 meters). Refer to survey plan in photo gallery. Access to the land is excellent year-round and there is snow removal in winter months. Maintained paved highways from the Provinces three main cities of Moncton, Fredericton and St. John take you to your land via Highway 905 or Highway 895 and Green Road. In no time you can reach the nearby friendly communities of Elgin, Petitcodiac, and Sussex by car, ATV and even snowmobile in winter months! In Elgin you’ll enjoy the Maple Tree Café and Pollett River - a great place to hang out in refreshing river pools on hot summer days. The welcoming community of Elgin has a population of approximately 1,000 and local amenities include a post office, fire hall, church, community center, café and playground. The larger town of Petitcodiac (pop. 1,444) is 22.5 kilometers distant. The vibrant city of Moncton (pop. 120,000), the province’s largest city and urban centre, is 65 kilometers distant, and easily reached via well maintained paved country roads and highways. Greater Moncton International Airport has flights arriving and departing to major centres within Canada and New Jersey, USA. The major activity in this area is forestry mixed with light agriculture, including dairy and beef production, as well as maple syrup and wild blueberry production. Fundy National Park on the Bay of Fundy is just 30 minutes south of your land via Route 895 and Route 114 and via the recreation trail network. Here you can experience the world’s highest tides, pristine forests, excellent hiking trails which lead to waterfalls deep in Acadian forests. Paddle in a kayak as the waters rise up to 12 metres or more. Walk the otherworldly sea floor at low tide. Fundy is a Maritime treasure. Term Sale: $12,000.00, payable $900.00 cash with order and sixty (60) monthly payments of $185.00 each, and interest. 10% discount if paid in full within 30 days: $10,800.00, if paid $800.00 down payment with order and the balance of $10,000.00 within thirty days thereafter.